Enrollment has declined at Thornydale since 1994, with an enrollment of 733 students, to an enrollment of 306 students this school year, according to the district. 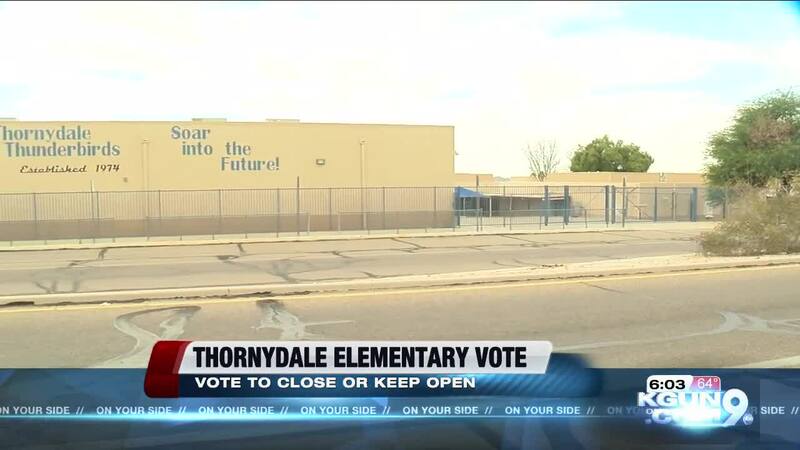 MARANA, Ariz. - The Marana Unified School District may come to a decision Thursday night surrounding the possible closure of Thornydale Elementary School. Last month, Thornydale parents were sent a letter regarding two public meetings to discuss the school's future. According to MUSD, the closure is being considered due to low enrollment numbers over the past several years. If the board decided to close Thornydale, the students would be placed at either Quail Run or Butterfield Elementary Schools. But some parents who have students at Butterfield say the parking lot is already crowded during pick-up time. That's why they hope the board decided to keep Thornydale Elementary school open. The district considered closing the school earlier this year, but voted to keep it open in April after parents vocally opposed the closure . At a meeting on Nov. 20 , parents and community members were given the opportunity to share reasons for and against the closure of the school. The MUSD Governing Board is considering the closure of Thornydale in June 2019. If the board votes to close the school, new boundaries would be drawn to change the attendance boundary currently serving the Thornydale Elementary area to either Quail Run Elementary or Butterfield Elementary. The meeting is on Dec. 6 at 7 p.m. at the Marana Municipal Complex.